How lucky has Panerai Central been in 2013? We got a chance to steal a little time from John Glance of Dangerous9straps and conduct an exclusive interview with this premier strap maker out of Germany. Panerai Central: What got you involved in the custom strap making business and how long have you been perfecting your craft? John: Several years ago I lost my watch while hiking in Austria and as a result when I got home to California (where I lived at the time), I started shopping for a new watch, the first watch that caught my eye was an Oris F1 chronograph. That started the watch addiction. Somewhere along the way I started looking at watch straps and was amazed at the great work and told my wife that I could make strap just as good (I had at one time been a leather crafter, before we met). Of course she was dubious and so as challenge, I decided to make a batch. That was 3 years ago. I’m a bit of an obsessive, and so I’m still very much perfecting my craft, learning from every source I can find to help me toward my goal of becoming the world’s best strap maker. 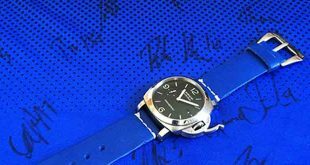 Panerai Central: How long does it take you to custom make a strap for a consumer? John: I don’t typically time myself, but it certainly depends of the level of complexity of the strap ordered. I would say a standard leather strap can take as little at 2 hours, and a very complex Exotic skin strap with complicated design features can take an entire day. Panerai Central: Where do you source your beautiful leather and skins for your straps and what draws you to a specific style or color? John: Coming from America, many of my materials originally were supplied from there, but I’m trying to source as many materials from Europe whenever possible. My leather is primarily from German Tanneries, The Exotic skins are from nearly everywhere. Thailand for Stingray, American Alligator is of course originally from the US, but my supplier (Swiss Hides) is based in Switzerland. Our Ostrich Leg skins are from South Africa, but my supplier (The Flying Ostrich is US based). Our Eel skin is also sourced from Thailand, but our supplier is here in Germany. And of course our Kangaroo and Cane Toad hides are from Australia. I also work with vintage Ammo leathers made from ammunition pouches from Switzerland, Germany, France and Sweden. I find that I really love all kinds of strap material depending on the watch I’m wearing and the mood I’m in. While I love Alligator and especially Ostrich leg skin straps, but I find myself mostly wearing Swiss Ammo straps and my leather straps, most of which I’ve had from my early days of strap making and tend to be a bit on the rustic side. Panerai Central: Looking at your straps what do you bring to the market that you feel is unique and stands out above the rest? A. Personal Service – We communicate in great detail with our customers about every aspect of their watch strap and are happy to discuss every element of their strap design to make sure they’ll love their new Dangerous9strap. We never rush our customer’s decision process. We understand that when a customer is ordering a bespoke watch strap from us, they’re buying more that just a watch strap they’re buying an experience. The luxury is in the purchase experience. Most or our customers are passionate watch collectors like we are and their watch straps are an essential and natural extension of that passion. B. Materials – Using the very best materials inside and out, Dangerous9straps are made from only the very best quality leathers and exotic skins and threads available. Nothing goes inside of a Dangerous9strap that I wouldn’t be proud to have on the outside. In our exotic skin straps we use only vegetable tanned leather mid-layers and padding layers (unlike most manufactured straps). These are the very same expensive, high quality leathers we use to build our leather straps. 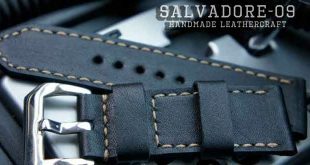 This guarantees our straps will be solidly built and with proper care, last for many years. C. Custom colors, hand dying and staining techniques – Most of our leather straps are hand dyed and stained, which allows us to create unique and dynamic leather straps that are one of a kind. This has recently extended to many of our exotic skin straps, because of our depth of understanding of leather dying techniques, we are able to custom dye many exotic skins as well to provide custom color combinations both of outer straps as well as linings. D. Beautiful and Exotic linings – Our ‘SuperExotica’ Series straps represent a unique combination of exotic leathers both for the outside of the strap, and for the lining as well. Our thinking about a custom watch strap is that the luxury should extend all the way in to the lining. Luxury is what’s in the inside – even if no else knows it’s there – you’ll know. The smoothness of Eel skin, the soft comfort of round scale Alligator, or the flash of mustard yellow Sea Snake as you put your watch on, perfectly matched to your watch and the outside strap skin. Designed in consultation with our customer, and in many cased in one of a kind combinations, make a private luxury experience that is the essence of a Dangerou9strap. E. Stitching – Every strap that Dangerous9straps have ever produced has been hand stitched using waxed linen thread. This traditional technique and thread has been a hallmark of fine shoe and saddle makers for centuries and the mark of quality that connects every Dangerous9 strap to that tradition. Panerai Central: What are your thoughts on the expanding popularity of interchangeable straps on watches and all the custom straps out on the market today? John: This is obviously good for my business. I think for the brands that are becoming more associated the a thriving custom strap market such as Panerai and increasingly Bell & Ross, it really increases brand attachment and even loyalty among the brand’s core enthusiasts and creates more popularity among watch collectors. To me the watch brands that wish a conscious effort to build passion and enthusiasm should focus more on the watch strap as a means of making the watch more fun and interesting to wear. A really great strap can have an enormous benefit to the experience of wearing and enjoying a watch and is a great way to personalize the wearing experience. Panerai Central: What is your favorite Panerai model and why? Panerai Central: What is your most outrageous strap request? John: I recently completed a custom dyed Green Alligator hornback spliced with belly skin where the buckle interfaces the strap and another hornback section spliced on at the strap tip for a Panerai watch owner. That was a really challenging strap to make, but it really turned out great. If your readers would like to check it out, they should visit my Facebook page. Panerai Central: Is there any material you are dying to work with but haven’t had the chance? John: I’m getting new materials all the time, so, I have a hard time just keeping up with getting sample straps made from the newest stuff coming in. I’m expecting a shipment of really great looking Kangaroo hides from Australia. I’ve been using kangaroo as a lining option for a while, but these skins will be for the out layer strap and they’ve got great colors and textures and are of course super strong and should make really high quality straps. I’ll also be getting Shell Cordovan in pretty soon and am looking forward to working with it as well. I would say that of the exotic skins, I would like to try salt water Crocodile from Australia, I hear it’s a really great material to work with, but sourcing it here from Europe is a bit complicated, so for now I’ll stick with American Alligator. Panerai Central: I see that you make straps for all types of watches. What brand do you get the most requests for? John: Of course, Panerai is the brand most requested, and I’ve been making Bell & Ross straps from the beginning. the remaining 1/3 is divided between many different brands such as IWC, Breitling, Jeager Lecoultre, Rolex, Omega and Graham, U-Boat, BRM, etc. I also get a lot of requests from boutique brands – Kaventsmann, VDB, Ennebi and Enzo Mechana, which I love too and have a passion for as well. I should also note that I don’t only make straps for expensive watches. I believe any quality watch can benefit from a great custom strap and I’ve also made a number of straps for more reasonably priced yet still high quality watches including Lum-Tec, Helson, Armida, Benarus, etc., some of these watches are in my personal collection and I love them. Panerai Central: We know that you are one of the premier strap makers in the industry, but are you a watch collector as well? If so how many and what is your favorite watch? John: I currently have over 20 watches in my collection. It would be very difficult for me to say which is my favorite. My most recent acquisition is a Kavenstmann Bathyal, which is huge and bronze and I’ve got to say is my current favorite and I recommend the brand highly, they are handmade here in Germany in very limited numbers and really astonishing watches. Panerai Central: Obviously straps are your main focus but do you want to get into making other things in the future? John: Watch straps are keeping me very busy at the moment, but in the future, I would love to expand into other personal leather luxury goods, it’s just a matter of time and increasing the size of my operation. Panerai Central: Do you frequent watch forums and communities? If so what are your favorites? John: I haven’t had a lot of time to spend on the forums recently, but when I do have a moment, I love to drop by BR-avo.com, which is a Bell & Ross dedicated forum and with a lot of really great members – by far the most fun watch forum that I’ve found. Of course I’ll usually drop by Paneristi and WatchUseek as well. There are so many great on line forums to enjoy, but so little time. Panerai Central: Is strap making your primary form of income or is this more of a hobby for you? John: It’s a full time business for me since we’ve relocated from California to Munich, Germany. Panerai Central: If you weren’t making straps what would you see yourself doing? John: If I weren’t making straps, I think I would in some other way be involved in starting another personal luxury brand. Panerai Central: We love how you personalize each strap with a nice tag, what brought you to do that? 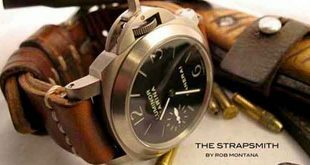 John: This is just an extension of the personalized service that I try to give all my customers from the design of their straps through to the personalization of the completed project. When I make a straps I make it just for that individual customer and I want them to know their strap was made for them and no one else. I’ve got the best and most loyal customers in the world and many of them have become friends, even though because of the distances involved, many of them I’ve not had the good fortune to meet in person. Panerai Central: I understand you are in Germany, how is the watch community out there as compared to the states? John: Thriving! Obviously somewhat smaller due to the populations involved, but I find that in terms of passion for watches, the Germans and Europeans in general are second to none and as time goes on and I become more well know here in Germany, I’m enjoying making more straps for my fellow German and European based Watch lovers. Panerai Central: Where do the most orders come from, country wise? John: Still the good old USA, although, I’ve noticed a definite trend towards international customers since I’ve relocated to Europe and straps shipped to European and Asian countries are becoming an ever increasing part of my business. I’m always happy to hear from customers from anywhere in the world.